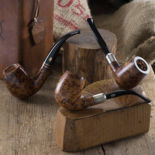 WARRANTY : Only our experts are able to decide to exchange or repair any pipe CHACOM or another brand of our manufacturing must be ABSOLUTELY sent for expertise. You must know that the stems are not standard and each repair mechanism needs special attention. We ask you not to exchange a pipe from your stock. As exchanges are covered only once, the pipe that we exchange is marked with the letter "E" on the shank. Except in our factory store, we do not handle repairs. Thank you to contact an authorized retailer who will send us your pipes. For pipes which are not of our manufacturing, eager to be of service to a maximum of our loyal customers, in the case we deem to fix your pipe, we agree to repair but with no guarantee regarding the risk of breakage. IMPORTANT: The use of "Jet Flame" lighters is not recommended for pipes and we cannot take collateral damage caused by the use of this kind of torch.